Display market has registered itself as one of the most potential fraternities in electronics and media industry. The growth can be attributed to the digital revolution in customer-brand interaction model. Advancements in digital technologies, according to experts, have played a center role in shaping the way consumers nowadays think about and engage with brands. In the backdrop of this scenario where consumer expectations are much higher and advanced than before, a paradigm shift has been observed in how & where users interact with services and products – display market is overtly one of the top beneficiaries of these changing trends. 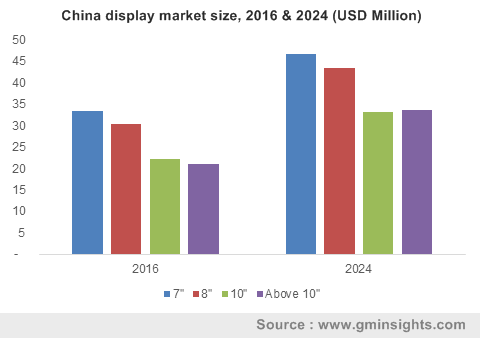 Reliable reports cite that display market size was valued at over USD 7 billion in 2016, with global shipments exceeding 45 million units. Analysts deem that in a bid to offer intuitive interactions between user & deceives, several companies around the world are committing to display & touchscreen technologies, in turn creating phenomenal growth prospects for the global display industry share. The finance & retail sectors aptly exemplify the phenomenal growth of the display market. The digital POS displays, smart ATMs, NFC-enabled terminals, and Kiosks have rapidly emerged as the most preferred mediums to engage with customers and offer them personalized services. Display market players, in this regard, have been going the whole hog to perpetually come up with innovative range of products in sync with the ever-changing customer preference. Looking at the current trends, analysts deem that the retail and finance sectors stand poised to embellish display market growth. However, in the coming years the market is expected to witness an appreciable growth rate from the healthcare sector. Representing another example of the heightened interest in this domain, the retail pharmacies are touted to be the lucrative investment grounds for display industry participants. According to recent news snippet, New York City health systems is the latest to have joined forces with national pharmacy chains on a telehealth initiative to use kiosks to provide patients and other consumers with on-demand healthcare. Reportedly, the Florida-based BayCare Health System and the New York based Presbyterian have announced new digital health delivery programs with Publix and Walgreens respectively. Sources reveal that this move of the two health systems will in turn allow the patients to access doctors from institutions via telehealth kiosks. Elaborating further, these kiosks are equipped with HD cameras and healthcare tools such as the blood pressure cuff, pulse oximeters, and thermometers, which the patients can operate in private rooms. In fact, according to sources, patients can sit down at the telehealth kiosks and be connected within no time to board-certified physicians. They can also send prescription requests immediately to any pharmacy the patients desires. Industry experts deem the rising efforts of these healthcare companies to connect with their customer base through the development of digital and user-friendly components like the kiosks, to have massively upscaled its stance in display market. Another relevant instance is of Fujitsu, which made it to the headline for announcing its Med-ServTM 50 patient registration kiosk platform that allows healthcare ISVs (independent software vendors) to provide new applications that can reduce patient stress and cut overall healthcare costs. Considering the healthcare industry to be adopting software and display technologies at an unprecedented pace, it is pivotal for prospective stakeholders to take note of this trend to garner lucrative proceeds in the coming years. Restaurants, entertainment, and ticketing are some other profitable display market growth areas where kiosks and POS displays are gaining traction. Considered as the second-generation products that marked the most high-profile entry in the burgeoning display industry, foldable displays are likely to procure a major market chunk in the years ahead. In fact, smartphone industry giants including the likes of Samsung and LG are reportedly creating flexible OLEDs that can be rolled up or folded down to fit into pockets. With these trending technologies maturing sooner than anticipated, the display market potential seems to be quite promising. A report compiled by Global Market Insights, Inc., anticipates the display market to be a massive 20-billion-dollar business space by 2024.